Avoid thousands of pesos or more in penalties by making tax payments on time. 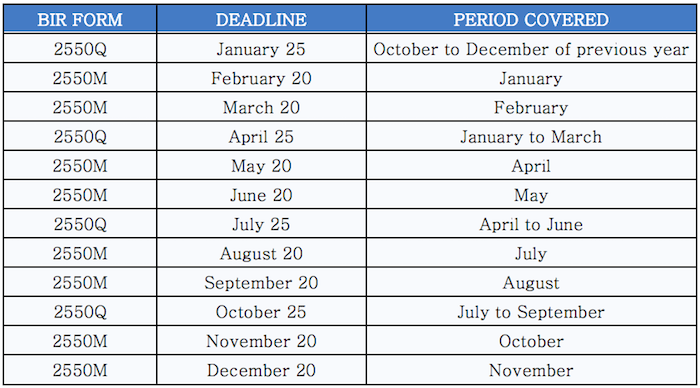 Bookmark this page so you don't forget those important BIR deadlines! Minding your business’s tax obligations is as important as your day-to-day operations. In fact, if you fail to pay your taxes on the specified deadline, the Bureau of Internal Revenue (BIR) will require you to pay a surcharge plus interest and other penalties on top of the actual tax amount due. Even if you have zero income to declare, failing to declare it on time results in a penalty of P1,000. For your business, that can mean losing tens of thousands of pesos, if not more. According to EJ Arboleda, co-founder and chief executive officer of Taxumo, these penalties are applied as soon as April 16, or the day immediately following the annual income tax deadline of April 15. April 15. That date is just around the corner. If your business is registered as a sole proprietorship, or if you are self-employed, a freelancer, or an independent professional, you’ll need to pay your income tax on this date. The annual income tax payment you make on April 15 covers the period from January to December of the previous year. *October to December is covered in the April 15 filing. Take note that requirements vary according to the type of tax you are paying. Check the BIR website for the list of accompanying documents which may be required in addition to the BIR forms specified above. “In the Philippines, tax is a huge cost for businesses,” says Arboleda, who established Taxumo as a tax filing platform for freelancers, small business owners, and self-employed professionals. While you may rely on your accountant to maintain your accounting books and make sure that tax filing deadlines are met, Arboleda reminds that at the end of the day, you are ultimately accountable for your tax obligations as a business owner. In other words, being a responsible tax payer is key to smoothly operating a legitimate business. Learn more about what every business owner should know, sign up to Globe myBusiness Academy. Does Your Business Really Need to Be Open During the Holy Week?